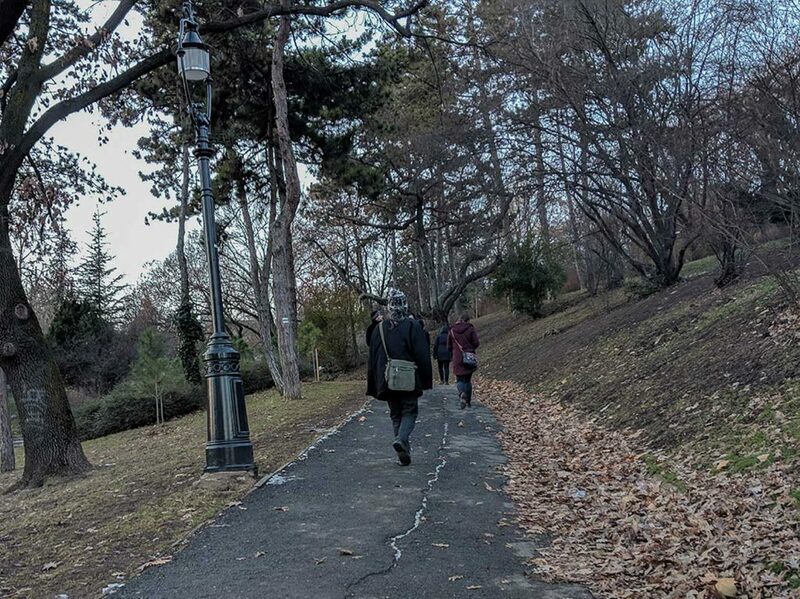 Most certainly one of the coolest hills we have trekked, Gellért Hill is a must if you find yourself in Budapest. 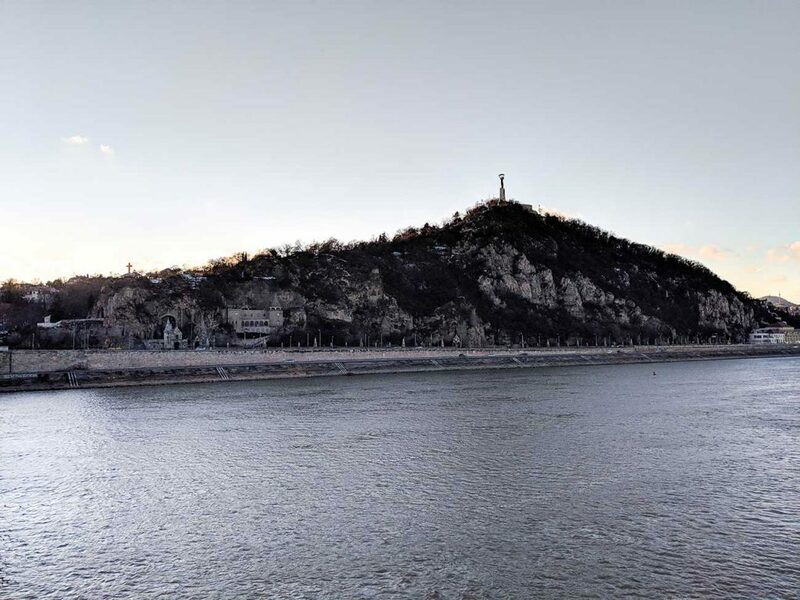 Gellért Hill received its name from Bishop Gellért, who was rolled down the hill in a barrel by pagans during an uprising in 1046 AD. 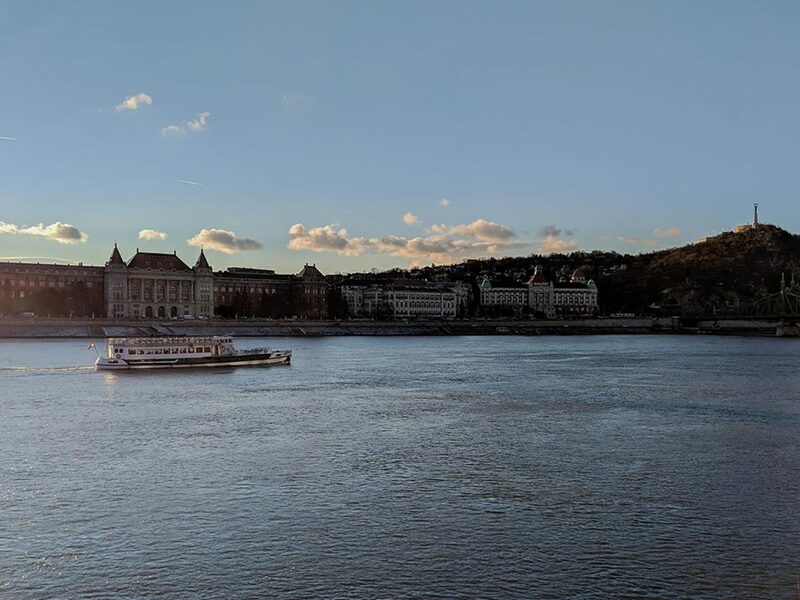 Located near the famous Liberty Bridge, Gellért Hill allows you to see the beautiful Danube River, and the cities on either side, Buda and Pest. There’s also a really cool part of history when you make it to the top. So, what are you waiting for? We recommend taking the subway. Gellért Hill is all about the green line, M4. There are two options here. 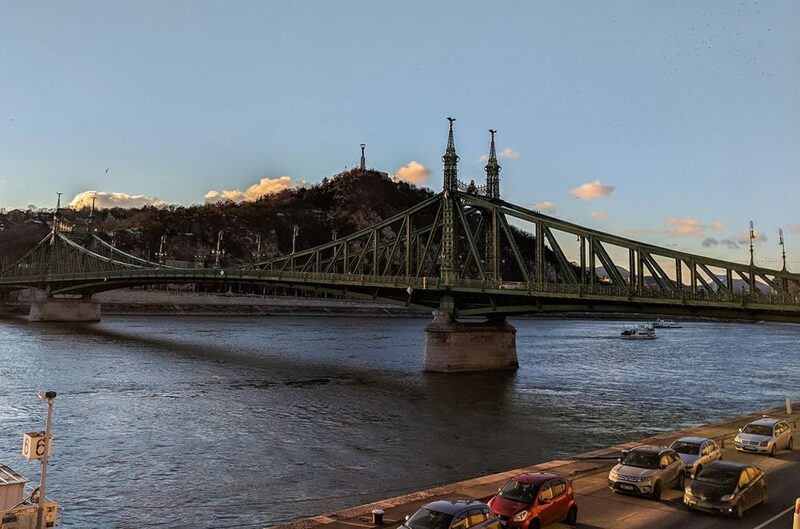 Firstly, you can depart the metro at Fővám tér, and take a walk across Liberty Bridge, which you should do! There’s also the Great Market Hall nearby, which if you’re looking for some local goods and a local experience, you should check out. For a smaller scale local market, check out our post on Rákóczi Market Hall. Your second option is to take the M4 line to Szent Gellért tér, from which you have a three-minute walk, past the Hotel Gellért. But really, you should walk across Liberty Bridge so choose the first option. The wide Danube flows beneath you and it’s a wonderful sight to see. If you’re as lucky as we were, you’ll visit in January and hurry across because the bitterly cold wind is numbing your face. Ok, that was sarcasm. Lucky wasn’t the right word. 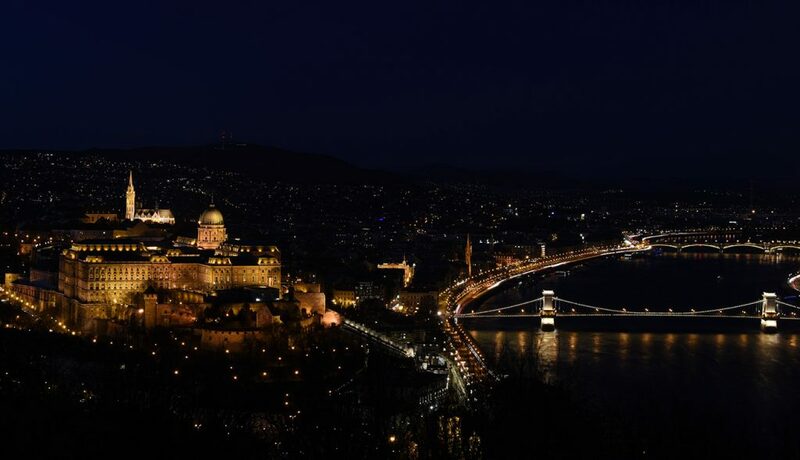 But what we want to convey to you is that even in the coldest time of year, Budapest is absolutely beautiful. Just dress in layers! For those that take the tram or bus, be on the lookout for these same stops. BKK, Budapest’s transport department, does an awesome job! The city is so easy to maneuver and it’s very cheap to do so! 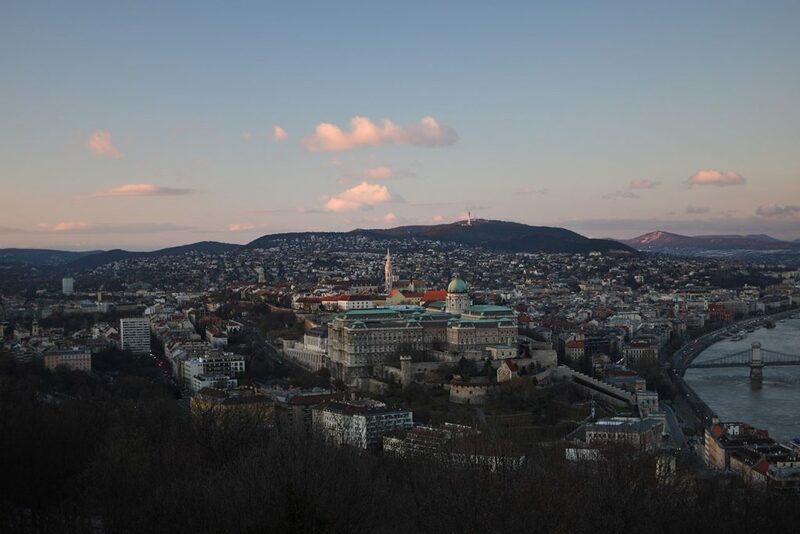 We began our Gellért Hill adventure from our Airbnb with the idea of a sunset view. It was a 40 minute walk, which seems like a long one. But when you walk along the Danube, even in the bitter cold, there are no problems in the world. Liberty Bridge was our next stop. Liberty Bridge was the first bridge to be repaired after the Nazis retreated from the city. Therefore, it was the first bridge to connect Buda and Pest after World War II. That’s a big deal. After a horribly cold but fun walk across the Danube, we arrived at Gellért Hill. The walk up takes about 10 minutes, longer if you stop at the random observation points and take in the sights. 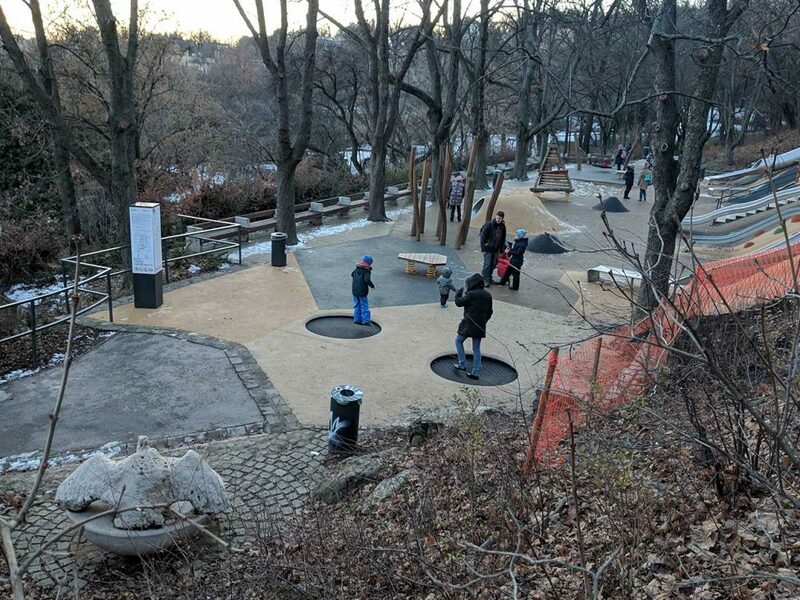 You can also see locals playing in the parks, walking their dogs, or running as you make your ascent. Once at the top, we could finally see the bronze Liberty Statue up close and personal. She’s visible from many parts of the city so we had always wanted to make the climb to see her in person. 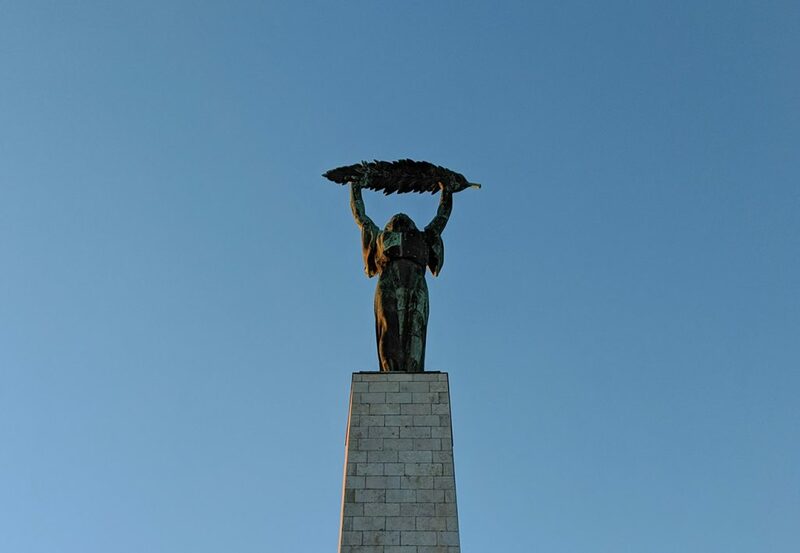 This statue, a woman holding a palm leaf, was erected by the Soviets in 1947 and it originally commemorated the Soviet hero liberators. 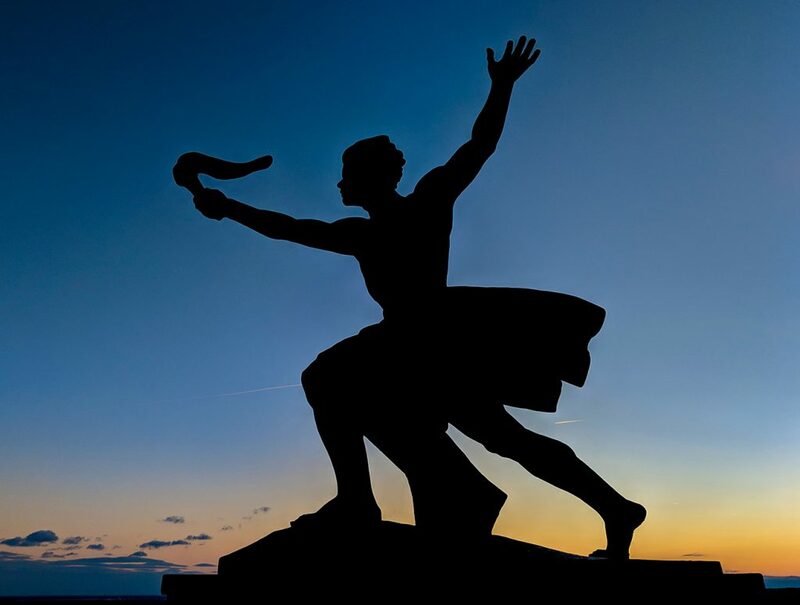 However, after the fall of communist rule, in 1989, the Hungarians decided to keep the statue but change the words. It now reads, “To the memory of those all who sacrificed their lives for the independence, freedom, and prosperity of Hungary.” There is now no mention of Soviets. In addition to the Liberty Statue, there are two smaller statues beside her. Behind these statues, you can find the citadel. The citadel dates back to the mid-19th century. Built by the Austro-Hungarian Empire, it was a means to control the rebellious Hungarian people. Many years later, the Soviets used this citadel to quell a Hungarian rebellion in 1956 by firing tanks down on the city. So, after we had spent some time atop this hill, taking in all the history, we watched the sunset. Needless to say, it got even colder. We were so happy to find a vendor by the statues. There’s a man that sells coffee, hot tea, and mulled wine from the back of his electric car. It was almost $4 for a small cup of mulled wine, which is pricey, but we didn’t care. We were freezing and it was so warm. We braved the cold as long as we could, spending almost two hours at the top, getting pictures and watching the lights slowly come alive across Budapest. It was a memorable night for sure. 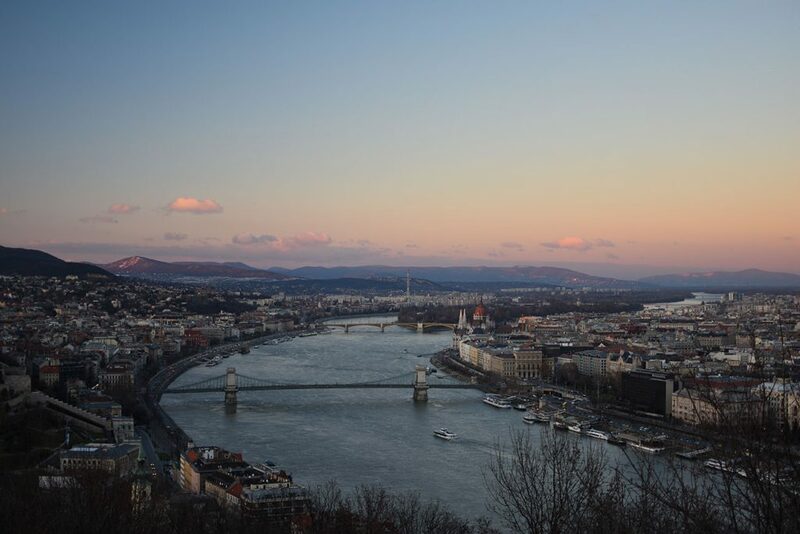 If you have a warmer day or just want to see more, Gellért Hill has more to see! You can see the statue of Bishop Gellért, who this hill is named after. There’s also the Cave Church, which is literally a church in a natural cave system. Admission is free! This is just one of the many things to see and do in Budapest. 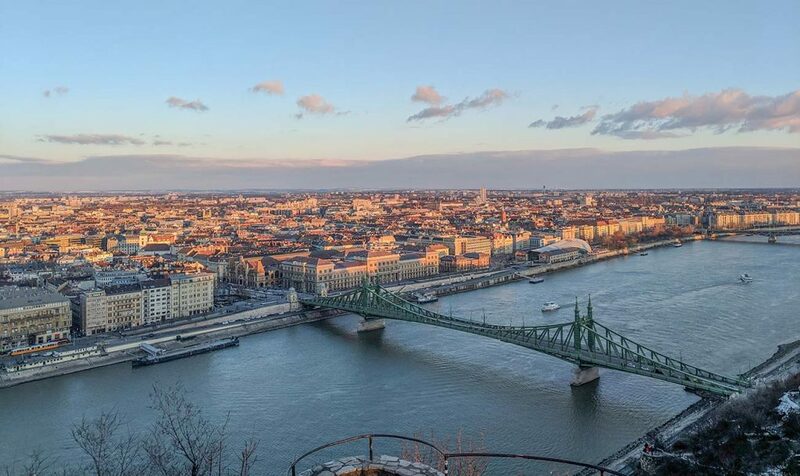 We hope you get to see Budapest from this vantage point and appreciate some of the important history this city has to offer. I really like how you show the hill from the bottom at the beginning of your post and then show us the amazing views from the top! I always try to share in my posts where the best views of the cities I visit can be seen, and it’s cool that you did the same! Your shots after dark are also incredible! Fabulous views and great images! I’ve somehow yet to visit Budapest, but it’s definitely on the top of my list. There’s so much to see and I’d love to check out that cave church! Yes, see the cave church! There are caves that run for many kilometers under Buda Castle and exploring them is a lot of fun. Thanks for this. Budapest is on my list and I’m always looking for the best vantage points for photos, especially at sunset and night time. Despite the cold you had, I think watching the sunset with a cup of mulled wine in your hands sounds like a perfect evening! Great spot for pictures here! The mulled wine made it bearable for a while, but that cold wind finally took its toll! 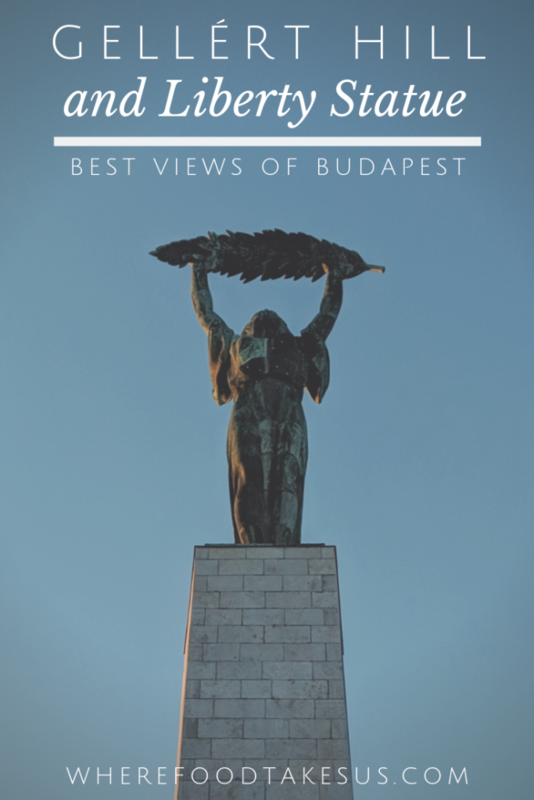 This post struck a chord with me as Budapest was one of my best travel experiences ever! I did the same area and took mostly the same photographs (though yours are better). 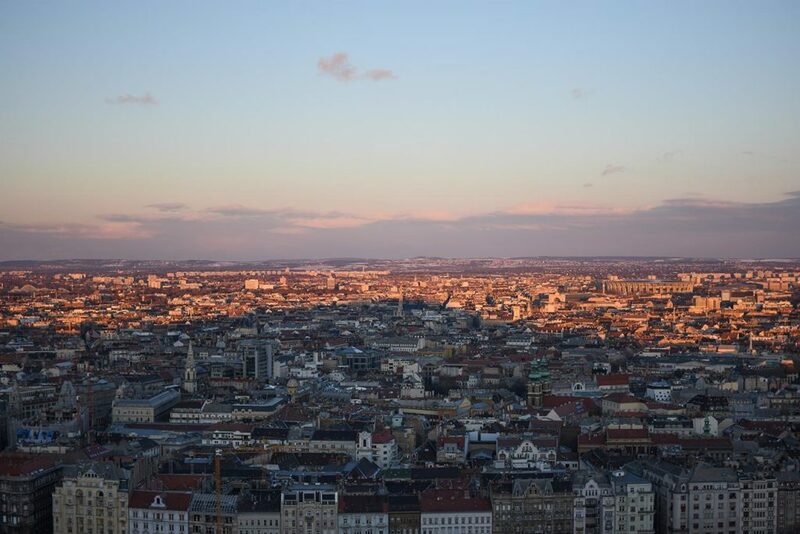 Budapest is such a special place and you’ve captured the magic of it quite nicely. So glad you got to experience it too! Hopefully it wasn’t as cold for you haha. Thanks for sharing! What fabulous views! We haven’t been to Budapest yet (definitely will some day) but this hike is going on my list! Hope you get to visit! The view from the top is stellar! I would totally want to do this as well, as it looks like an enjoyable hike and you get to experience a slice of local life and history. Loving the night shots you included, very romantic. 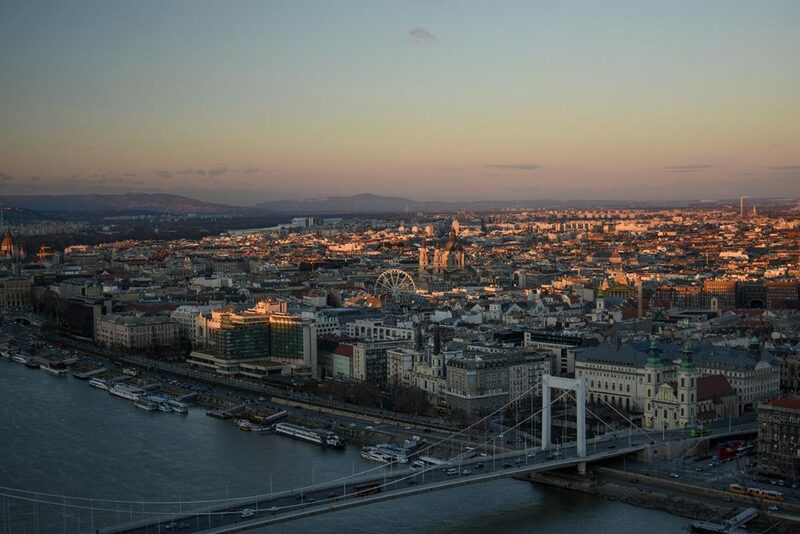 Yes, it’s a wonderful view of Budapest. Would be more enjoyable if it wasn’t freezing! Hi! We just moved to Hungary a while ago and are not so far away from Budapest. We also loved this spot in the city. The views are amazing. You captured it well in your photographs! Wow, how exciting! Seems like a cool country to live in. You’ll get to really experience it! Thanks for commenting. I have not been to Budapest but have a great interest in going. Your writing and beautiful pictures have enticed me even more. I find it so interesting that they kept the statue but changed its dedication. How lovely. Gorgeous city views! This was one of our favourite spots in the city too and it really makes us want to go back to Budapest!! We loved the views over the city but also we have an interest in Soviet history so the statues were really interesting too and the photos of them with the city in the background work really well! 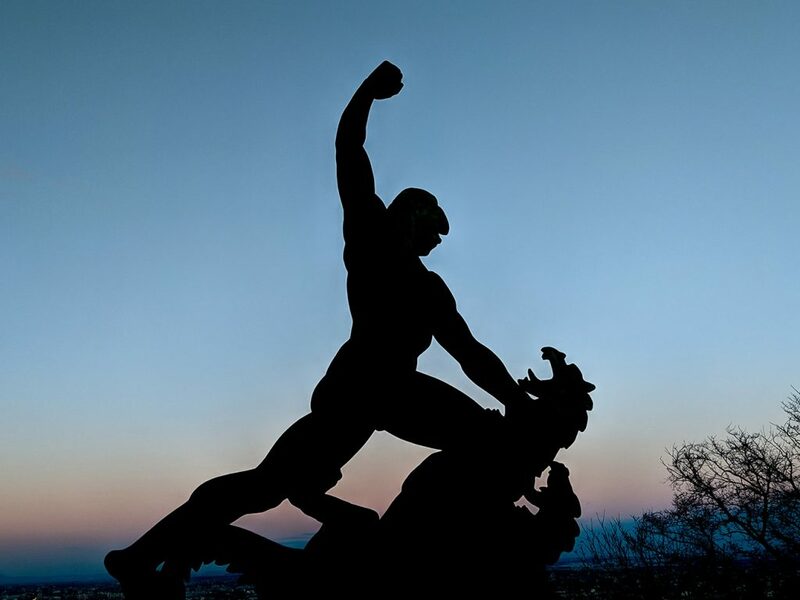 Budapest is a great city for Soviet history! There’s also the Hospital in the Rock Museum, which seemed pretty unique to us, so hopefully you were able to check that out. What a gorgeous view of the city! It was definitely worth braving the cold for. Now did you imagine being rolled down a barrel from the top! What a interesting tidbit of history! I also didn’t know about the liberty bridge being the first one to be repaired either! Thanks for sharing! Thanks for your comment! Yes, the barrel roll was quite interesting to learn about but also terrifying haha. Budapest is full of history and is a great city to visit.